When the clock on the scoreboard hit zero, Hamza Mohamed was jubilant. His high school football team had just advanced to the state quarterfinals for the first time in 30 years. His friends and family rushed the field. His older brother, Kaafi Adeys, kissed him on the cheek, wrapped an arm around his neck and embraced him. Hamza could see the delight in Kaafi’s eyes. This made it all worth it. The two-a-days in the summer heat. Then tackling drills in the cold temperatures. Everyone congratulated him, lined up to take photos for their Instagram stories, proud that one of their own had succeeded. The usually stoic and measured 17-year-old could no longer control his emotions on that early November night. Tears streamed down his face. The senior linebacker is the most talented Somali-American football player in the history of Willmar, Minnesota, a small rural town outside of Minneapolis. And for most of his career as a Cardinal at Willmar Senior High School, Hamza has been the only Somali-American on the team, consistently, as most Somalis play sports familiar to them such as soccer or cross-country. Now in this town with a growing Somali population, Hamza is a role model for first-generation high-schoolers like him who don’t want to play soccer or run anymore. They stop him in the hallways and after games to let him know they’re proud of him and to say they’re inspired by him. They want to play football like Hamza, their all-American hero. One person missing at the game was Hamza’s mother — the one person he most wanted to make proud. Khadija Mohamed Jirow was where she was most days: looking after her retail shop, selling clothing, shoes, trinkets and more. She works there 12 hours a day, six days a week to provide for her family. Even if she wasn’t working, Hamza’s mom wouldn’t be at his game. She believes football is too violent and even tried to persuade Hamza to quit. He, of course, refused. Friends and family, including Hamza’s brother, Kaafi Adeys (second from left), have showed up consistently throughout the season to support Hamza. Coach Jon Konold said he had never seen that many Somalis at a Willmar football game in his 10 years of coaching at the school. For years, Hamza watched his brother, Kaafi, who is nine years older, thrive as an athlete. Born in Somalia, Adeys was a star cross-country runner for Willmar High School and helped the team win back-to-back state titles in 2006 and 2007. He is now an English-Somali interpreter. Jirow had another reservation about sports, one that ran much deeper for her. She wanted a “better life” for her children in the United States — and sports didn’t represent that for her. In 1998, Jirow, Adeys and her oldest daughter, Maqsuud Adeys, fled the war-torn country of Somalia for a Kenyan refugee camp. Her husband, Ali Jirow, had come to America seven years earlier, and the family reunited that year after they received asylum in the United States. Jirow and Ali Jirow eventually had three more children, including Hamza in 2001, but have since divorced. Over 20 years, the war displaced up to 1.5 million people. 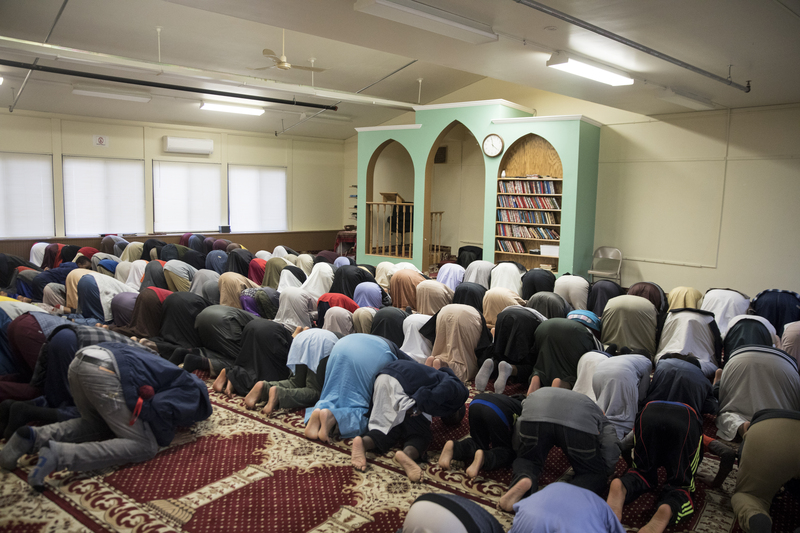 Somali-American Muslims worship during the fourth prayer of the day, The Maghrib prayer, at the town mosque. Most Somalis are Sunni Muslim. It is obligatory for Muslims to pray five times a day at specific times that depend on the location of the sun. The greater Minneapolis area has approximately 80,000 people of Somali heritage. Most live in Minnesota’s 5th congressional district, which elected Ilhan Omar — the first Somali-American Muslim woman in Congress — with more than 78 percent of the vote in November. Omar also came to this country as a refugee from Kenya. Over the past two decades, about 2,000 Somalis have found asylum in Willmar, population 19,628, making up about 10 percent of the total population. Most moved to the quiet Midwestern town to find a decent-paying job at the Jennie-O processing plant, the second largest turkey distributor in the country. The company employs close to 7,000 people and about one-third are of Somali descent. Many were refugees, including Anis Iman, a 30-year-old project manager who ran cross-country with Hamza’s brother, Kaafi. Iman’s father was murdered in Somalia by warlords looking to seize his farm in 1990. Iman was only 4 years old and doesn’t remember his father. He also doesn’t remember when his mother fled with his five siblings and him for a refugee camp in Kenya. The family traveled about 1,000 miles in the equatorial heat of northeast Africa and moved mostly by foot under the threat of malaria, hunger and violence. They reached the Kenyan refugee camp, but not before his sisters, an infant and a 2-year-old, died of starvation. Iman’s family gained asylum in Willmar after 12 years of living on one meal a day in the refugee camp. When Iman enrolled in Willmar High School, he didn’t have a formal education. He learned English within a year, graduated from high school and began managing 60 employees at Jennie-O by the time he was 22 years old. While Hamza did not endure the same hardships as Iman, he has found that working hard has made a difference for him, too, especially on the football field. Willmar head coach Jon Konold noticed Hamza’s work ethic right away. At 5-foot-9 and 175 pounds, Hamza is notably smaller than most of his teammates, but he is relentless in his on-field attack, using his hands to shed blocks and deciphering offenses on the fly to get himself in position for one-on-one tackles. He is generally a calm kid who gets along with his teammates and coaches, but he has an edge that works to his advantage. And Hamza has never been afraid to fend for himself — on or off the football field. He said when he was in middle school, he would get into fights with kids who ridiculed him because he was black or Somali. However, Hamza and other Somali-Americans interviewed for this story, including Willmar graduate Hamdi Kosar, generally agree the town is a safe haven for Somalis, and they feel accepted by most people around them. The Somali community has worked hard for that acceptance. They have transformed vacant storefronts downtown into bustling businesses, selling everything from colorful Islamic-style dresses imported from Dubai to cuts of wild camel meat. There are four Somali restaurants and 10 retail stores, which is quite astonishing considering Willmar’s downtown consists of only about three or four full blocks. A week after their historic victory in early November, Hamza and his Cardinals went on to beat Hermantown High School and Johnson Senior High School in the quarterfinals and semifinals, respectively, by a combined score of 106-20. 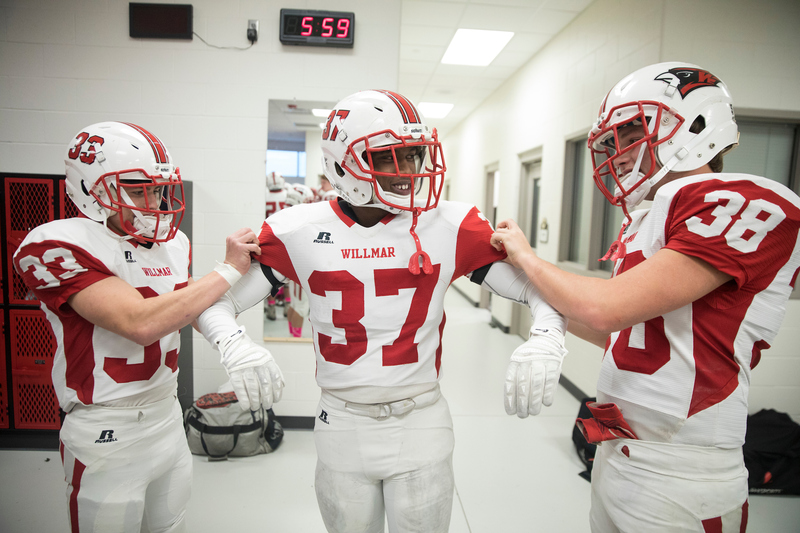 On the day after Thanksgiving, Willmar High School played in its first state championship game since 1973 under the lights of U.S. Bank Stadium, home of the Minnesota Vikings. But Willmar’s story wasn’t going to have its Hollywood ending. The team lost 44-18 to St. Paul Academy/Minnehaha Academy/Blake, a co-op football program, and ended the season 11-2. Hamza recorded seven tackles in the game, but it wasn’t enough. The season and quite possibly Hamza’s football career are over. He doesn’t have the size and speed to be a scholarship Division I athlete. If he were to play, it would most likely be for a junior college, but Hamza would rather attend the University of Minnesota Twin Cities and focus on academics, likely engineering. His mother would like that, too. Hamza and his teammates cried after the defeat. Not only because they lost, but also because they would never play with each other again. Hamza found something he never expected to find in football: a second family. One of those he considers family is linebacker and good friend Matt Bengtson. Hamza (right) and his mother, Khadija Mohamed Jirow (left), often agree to disagree. “I want my child to be a doctor,” Jirow said through Hamza as a translator. “But I also want him to do what he feels.” Hamza has tried to explain to her that he wants to become a technical engineer. More than 40 of Hamza’s family members from around Minnesota showed up to the game. Hamza, fresh off the loss, teared up at the sight of his cheering section. Even Hamza’s mom was there. She could tell he’d been crying, and instantly, tears welled up in her eyes. She did what any loving mother would do. She comforted him. Jirow didn’t flee from the only home she knew so Hamza could play football, but for the first time, she saw her son for the accomplished, hardworking athlete he was — and she was proud of him. Tesfaye Negussie is a digital producer who creates video content for The Undefeated. He likes DMV sports (the Washington football team, Wizards and Terps), hip-hop, playing basketball and eating abnormally spicy foods. He will laugh at all of his own jokes. Even if you don’t.